1. When did you start fishing? What was the catalyst? I started fishing at about 3 years old. My Dad would take us RV camping. We would bank fish for catfish. I remember setting up the poles and leaving them overnight. Then, I’d be excited to run down and check them the next morning to see what we had. 2. If you could only use one rod and one lure, what would it be and why? I like throwing a chatter bait. It is a very versatile bait. Slow roll it or burn it – open water, stumps, pad fishing. 3. If you could fish any body of water in the world, what would it be and why? That’s a tough question, because they are all so different. It’s hard to pick just one. 4. 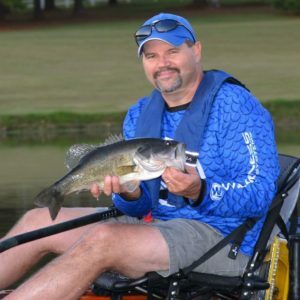 What is your go-to bait and technique when the bite gets tough during a tournament? Slow it down with a Senko with Texas rig or jig head. 5. You’ve put lots of kayak brands and models to the test. Which is your choice for top performer? Wilderness Systems ATAK 120 or the Radar 135. The ATAK is very stable, and the 135 gives me the mobility and stability I need. 6. What advice would you give to someone who wants to start kayak fishing? 7. TourneyX has been a huge success thus far! What are you most excited about for the brand in 2018? Meeting new anglers and growing the community.